OS X 10.8 Mountain Lion: Will Adobe software work? Now that OS X 10.8 Mountain Lion is available from the Mac App Store for a mere USD$19.99, you’re probably wondering how well your Adobe software and other Mac apps will run on it. Below is a summary of various reports I’ve read on Adobe.com and around the web. At this time, none of the CS5, 5.5 or CS6 applications require updates to be compatible with Mountain Lion. However, we do recommend that all users download the latest version of the Adobe Flash® Player runtime…In our testing we have found no significant issues with running CS5, 5.5, CS6 or Acrobat products with Mac OS X 10.8 Mountain Lion. We have worked closely with Apple to review Adobe Creative Suite 5, 5.5 and CS6 editions and individual products for impact on reliability, performance and user experience. Earlier versions of Adobe Photoshop® (CS3 and CS4), Lightroom 4.1, 4.0 and earlier software were also tested and there are currently no known issues. If your Adobe software is earlier than CS5, to run under Mountain Lion at all it must support Intel processors. After Apple switched to Intel-based Macs, Apple started phasing out support for running software based on the older PowerPC processors. Starting with Mac OS X 10.6 Snow Leopard, Mac OS X no longer runs PowerPC-based software. You’ll have to check compatibility for each of the Adobe applications you want to run; for example, Photoshop CS3 was the first version of Photoshop that ran on Intel-based Macs, so Mountain Lion will not allow Photoshop CS2 to run or even install. But even if your software older than CS5 runs on Mountain Lion, it may still have other issues because OS X has changed a lot since then. Flash: Apple has changed how Adobe Flash Player is allowed to work in OS X. 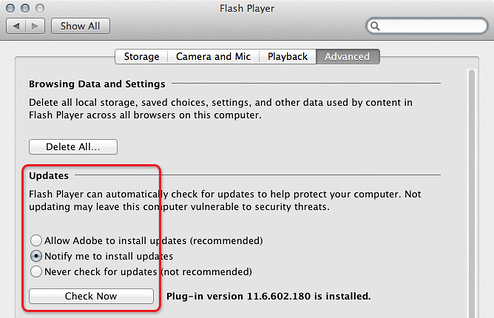 If you aren’t on the latest version of Flash, OS X may display a “Blocked Plug-in” message because Apple wants you to have the latest Flash security fixes. All you have to do is go into the Flash Player system preference and update it from there, or download the latest version of Flash from the link above and run the installer. Once that’s done, you’ll be able to view Flash content again. Mountain Lion (Mac OS v10.8) upgrade improves performance and stability with Premiere Pro. I’m guessing that this may be because of new code in Mountain Lion that Premiere Pro can take advantage of, because this isn’t the first time that happened: Premiere Pro also ran better after Apple added OpenCL improvements to the OS X 10.7.4 update. Update: Adobe has posted a Premiere Pro tech note about AVCHD video issues related to a change Apple made in Mountain Lion. Because Adobe only updated currently shipping software for Gatekeeper, if you run older versions of Adobe software you should review that section of the FAQ. Full-screen mode on multiple monitors: Since Lion, when a Mac application goes into the OS-native full-screen mode, all other connected monitors go blank, displaying only the gray “linen” desktop so that you can’t see your other apps. No one is able to explain why this is a good thing. The only change in Mountain Lion is that you can display the active application on any connected display…but you still can’t see any other apps. Adobe continues to use the traditional Adobe full screen modes in their apps such as Photoshop, Lightroom, and Illustrator. While some Mac users might complain that the Adobe way makes those apps “non-standard,” as a long-time Mac user trying to get things done with multiple apps on multiple monitors I find the Adobe full screen mode to be much more productive than the OS X implementation. Note: In OS X 10.9 Mavericks, Apple is changing how full screen apps work on multiple monitors. This may solve the current issues. 10-bit video displays: Photoshop users and other graphics professionals have been interested in properly supporting 10-bits-per-channel video displays on Macs. (This isn’t about the file format, but the data path to the video monitor. Most displays support 8 bits per channel of color, but some high-end monitors support 10 bits per pixel for smoother gradations and better color accuracy.) To support 10-bit video requires an unbroken chain of components: The monitor, the graphics card, the cable, the application, and the operating system and its graphics driver software. If any part of the chain doesn’t support 10-bit video, it won’t work. And it might not work on the Mac any time soon, due to Apple’s continuing lack of 10-bit video APIs in OS X. The displays are ready, the graphics cards are ready, compatible DisplayPort cables are ready, Photoshop is ready…OS X remains the one broken link in the chain. MacBook Pro with Retina Display [updated August 29, 2012]: Adobe has published a list of the first wave of their software that will support the high resolution of the MacBook Pro with Retina Display “over the next few months;” you can read about it in an Adobe blog post. Photoshop and Lightroom are both on that list. Presumably, the rest will follow a little later. Update: Photoshop CS6 and Illustrator CS6 received Retina Display support in the update released December 11, 2012. Run Adobe Updater to get them (choose Help > Updates in the software). 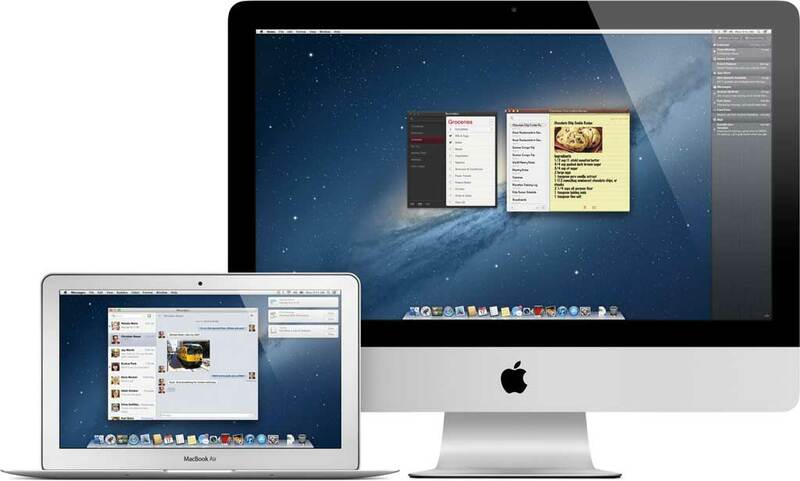 To learn about OS X software compatibility of Mac software in general, a great resource is the Roaring Apps database. It lists OS X software and its reported compatibility with OS X 10.7 Lion and 10.8 Mountain Lion. For mission-critical software, you should also check each company’s support website to verify that it works. If you’re updating from Mac OS X 10.6 or earlier, you may also want to read my blog post “Mac OS X 10.7 Lion: Will Adobe apps and other software work?”, so that you can also be up to date on the more dramatic changes that were introduced in Lion, such as the end of support for PowerPC-based software. Wondering what Mountain Lion is all about? For the most in-depth Mountain Lion review you’ll probably find anywhere, read John Siracusa’s review at Ars Technica. As with every major release of OS X, Siracusa not only reviews the visible features that Apple promotes, but goes under the surface to explain changes to some of the underlying technologies in OS X and how they affect your Mac experience. Have you ever had trouble reading a PDF file on an iOS device such as an iPad? A PDF file that was emailed to me wouldn’t open on iPhone or iPad, and not even the file name showed up correctly. The file opened normally on my computer, so I knew the PDF file wasn’t completely corrupted. While it’s still a mystery why the PDF file didn’t work on iOS, in the end I did fix the problem. Here’s how. I didn’t have access to the original document, so I couldn’t export the PDF file again from the source. I had to try and fix it on my side. I started by opening it in Adobe Acrobat X Pro, where I tried choosing File > Save As > PDF to write out a new copy of the file. After that didn’t work, I tried Reduced Size PDF on the same submenu. That didn’t work either. It didn’t help to open the PDF file in Apple Preview and choose File > Save As. At this point I was stumped. Knowing that the file worked fine on a computer, I was still convinced that there had to be a way to fix it. I next used Acrobat Pro X to save it to PDF-X/1A, a standard for high-end prepress. This time it failed even to convert, which turned out to be a good thing because the failure showed me an error message. The message suggested that I run the PDF through the Preflight feature using the Convert to sRGB preflight profile. That was a great idea; I should have thought of using Preflight sooner since the purpose of a preflight feature is to catch file problems before they cost time and money later down the line. 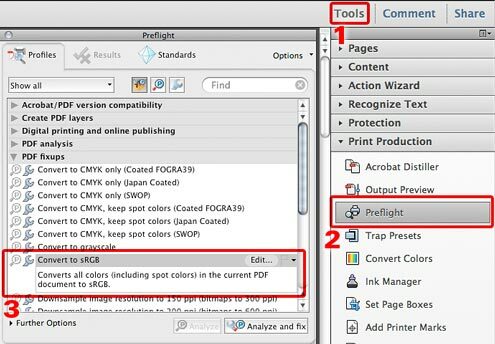 In Acrobat X Pro, Preflight is buried in the Print Production panel in the Tools pane on the right side of the Acrobat workspace. I selected Convert to sRGB, and then clicked the Analyze and Fix button. That worked! The next time I transferred the PDF file to iPad, it was perfectly readable. In the end, my troubleshooting guess was correct: Find something that can rewrite the PDF file radically enough to change whatever was causing the error, even without knowing the exact problem. While Apple Preview on a Mac doesn’t have the variety of production tools available in Acrobat Pro, there is another way to do something similar: Open ColorSync Utility, choose File > Open and open the PDF file, and then choose Create Generic PDFX-3 from the Filter pop-up menu at the bottom of the document window. I did not try that in my case, though, since I had already fixed mine. What might have caused the problem? I may never know for sure, but based on what fixed it, I’d guess that there was a problem with at least one of the color images in the PDF file. It looked like it had been created in Word with maps pasted from Windows screen shots. Maybe there were indexed-color BMP or GIF images in it. While that should not have been a problem, what we do know is that the Convert to sRGB preflight profile did fix the problem. While this solution solved my problem, it may not fix every problem with reading PDF files on iOS devices. If it doesn’t solve your issue, I hope that describing a successful troubleshooting process helps point you in the right direction. Good luck! Mac OS X 10.7 Lion: Will Adobe apps and other software work? 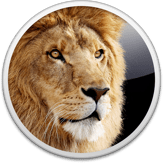 If you’ve got a fast Internet connection, a recent Mac, and US$29, what’s stopping you from downloading the just-released 10.7 Lion upgrade to Mac OS X? For many people, what stops them is being unsure whether the software they have is still going to work. In this article I’ve collected various reports I’ve run into around the web. In Mac OS X 10.6.7, Apple introduced a bug where if you have a document containing OpenType fonts, and used the OS X PDF engine to generate a PDF, you could have trouble opening it in Adobe Acrobat or printing it to to a PostScript printer. 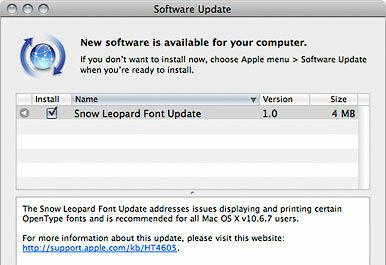 Apple has now addressed the problem through the Snow Leopard Font Update. This bug may seem obscure to some, but OpenType is a high-quality cross-platform font standard that professional designers rely on, so it was messing up some workflows. Also, OpenType fonts are bundled with some Adobe Creative Suite applications, so you may have those fonts on your computer even if you don’t remember installing them. Adobe has announced that there will be a web launch event introducing Adobe Creative Suite 5 on April 12, 2010. The launch page contains several preview videos of new features and workflows. The event is also billed as a “first look,” so don’t expect the software to be available right away.